Features: B&W Expanding on footage of Monk's 1967 tour shot by Christian Blackwood, Charlotte Zwering (Gimme Shelter) has created the definitive filmic portrait of the master bop pianist-composer. This captivating DVD digs deeper into the life of the famously eccentric pianist-composer than the Ken Burns's tepid coffeetable documentary Jazz ever thought to. A few shades different than the Burns film's monosyllabic, near-silent weirdo, Straight, No Chaser fleshes out Monk's character considerably -- from his harmonic theories to his use of quarter-tones (produced by hitting two adjacent piano keys simultaneously and occasionally even striking the boards with his entire forearm or his foot) to his mysterious relationship with his patron, baronness Nica de Koenigswarter. "Pannonica," a lyrical paean to her, is included on the soundtrack. Monk's music, naturally, is at the center of this canny portrait, giving fans cause to rejoice since most of the movie's performances had been previously unavailable in any form. The more interesting excavations include footage of his near-forgotten 1967 octet and rare recordings of club performances and rehearsal takes of Monk standards like "Well, You Needn't," "Trinkle Tinkle," "Evidence," and the title song. More curious is the inclusion of "Lulu's Back in Town," a corny Harry Warren-Al Dubin ditty, which Monk plays solo in a mellow homage to his stride predecessors. Straight, No Chaser is essential viewing for both jazz experts and novices, a smart, unflinching glance at one of 20th-Century music's greatest minds. Eddy Crouse This documentary of the late jazz great Thelonius Monk) (1917-1982) uses footage taken from 14 hours of European concert performances filmed in 1967-68 by Christian Blackwood. 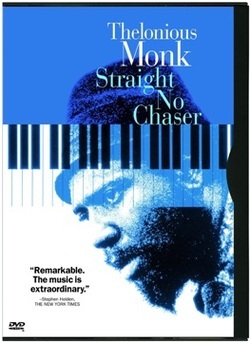 From his childhood in New York City's San Juan Hill, Monk grew up to become one of the most innovative jazz pianists of all time. Monk ushered in the bebop era of the 1940s and influenced such contemporary greats as Charlie Parker and Dizzy Gillespie. Interviews with Monk's manager Harry Colomby and Monk's son and namesake shed light on the character of the jazz giant. Executive producer Clint Eastwood got the idea for the project while researching the life of Charlie Parker for his film Bird.